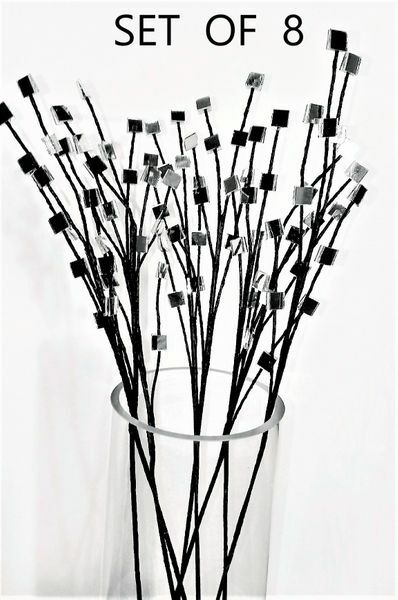 Add a pop of sparkle to wreaths, floral arrangements, trees and vases with this Set of 8, Mirror Branch Floral Sprays! 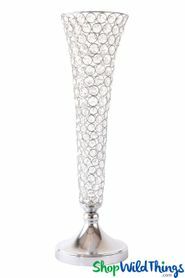 The total height is 18 1/2" tall with 5 mirrored branches that can be bent and moved to any position you desire, AND they easily move back their original, straight position! The wrapped stem is super dark brown (almost black) and is also totally bendable. 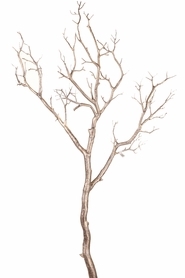 These branches are very durable and add lots of dimension! The mirrors are a 3/4" square and are attached to both sides of the branches. The main photo shows 8 branches as they come, the 2nd photo show the 8 branches spread out and the 3rd photo shows the flexibility of the stems. Even a plain vase or bottle looks swankier with the addition of these sprays and when combined with Artificial Floral Sprays, the whole arrangement looks brighter and upscale! Even in low lighting, the reflective mirrors add that sparkle factor that makes centerpiece decor classier. Add several to an Eiffel tower vase, tie with a colorful ribbon and done! Easy to add to wreaths, the stem is so flexible that these branches work wonders in Overhead Floral Chandeliers! Simply bend or wrap the stem around the frame to add texture and light or add some dimension and luster by adding to wedding arches! For a unique alternative to straight stems, curve, wave or coil the branches (it's so easy!)! To give you an idea of how dense these sprays are, in the first photo below, the vase on the left has 3 sprays in it, the vase in the middle has 2 sprays in it and the vase on the right has 1 spray in it.